Moosend is an easy-to-use, powerful, and exceptional email marketing automation software designed to facilitate the creation, management, and monitoring of email marketing campaigns. Thousands of agencies and businesses acclaim this software because it enables them to send the right email contents to the right people at the right time, automates their workflows, and elevates their ROI. Moosend is built with an award-winning email marketing campaign designer that has a drag-and-drop user interface. With this tool, users will be able to create, design, and customize stunning and responsive email newsletters that render beautifully on any type of device. The email marketing automation software also offers management features that allow users to strategically handle all the important things they need when it comes to launching email campaigns. The management features include the ability to collect customer data using opt-in or sign-up forms and create and segment email lists. The software boasts the level of automation that email marketers can achieve using the tool. Moosend is designed to automate email marketing workflows so that users can perform their tasks faster and engage with visitors, subscribers, and customers in an accurate and timely manner. With Moosend, they will be able to set up events that trigger the automatic execution of specific tasks. Moosend’s workflow automation capability helps them solve issues like reducing instances of shopping cart abandonment as well as gain insights into visitor behavior. Email marketing analytics is included in Moosend. The software delivers a simple yet powerful analytics tool that allows users to monitor and assess the performance of their email marketing campaigns. This tool provides real-time data that permits them to identify which links added to emails visitors and recipients are clicking, what email applications and devices subscribers are using when they are opening email campaigns, and what hours or days they are most active. Moosend automates email marketing campaigns and activities by integrating with some third-party tools. Users can also integrate their existing website or application with Moosend’s SMTP service to accelerate the delivery of transactional emails. 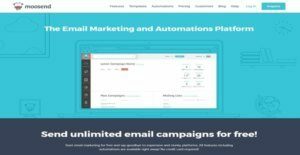 Moosend provides agencies, businesses, and marketers with the features and tools they need so they can launch effective and strategic email marketing campaigns. Before they launch email marketing campaigns, the software makes sure that everything is set up well. This covers data collection, email list building, and email list segmentation. Let us explore these features of the software and understand why they are very important for launching successful email marketing campaigns. To be able to target the right audiences, visitors, and recipients with the right email contents, users must collect all essential information about the people they want to reach out to. Fortunately, Moosend gives them that capability. With Moosend, they will be able to easily capture all the information they need about audiences, visitors, and recipients. The software enables them to add custom opt-in or sign-up forms to their own website, blog, or Facebook page. They can also edit the data fields within these forms so they can gather as many information as they want about the people they plan to engage with. They can use the captured data for personalizing email marketing campaigns, allowing them to reach out to the right people with the right email contents at the right time. Once users are done collecting contact data and information, the next step is to create an email list. An email list is a list of people they need to send out emails to. This list contains names, email addresses, and other important contact information. With Moosend, email lists can be expanded automatically through the aid of its import methods. Users can directly upload contacts to Moosend that are stored on a disk, third-party email service provider, CRM tool, Gmail, or Google Apps. Moosend allows users to segment their email list, which means they can organize contacts into different groups. They can segment them in any they want, taking into account the data they have collected and whatever criteria their business is requiring. This way, they will be able to send out relevant email contents, engage with the right people intelligently, increase click-through rates, lower unsubscribe rates, and make their email marketing campaigns more impactful. The email marketing automation software is built with a campaign design tool which makes it possible for users to create striking, stunning, professional-looking, and responsive email newsletters. This tool lets them design email newsletters even if they don’t have technical skills. They can create an email newsletter from scratch or configure and customize one of the email newsletter templates from Moosend’s template library. As mentioned earlier, these email newsletters are responsive; so, that means recipients can easily interact with the contents of the newsletters whatever type of device they are using. In fact, users can even test their email newsletters directly within the design tool to see how they will look like on different device types. One of the most powerful features offered by Moosend is workflow automation. With this feature, those email marketing processes and activities that are once manual and cumbersome are now streamlined and optimized. As a result, email marketers will be able to perform their tasks faster and reach out to visitors, recipients, subscribers, and customers in an accurate and timely manner. So how does Moosend automate email marketing workflows and tasks? The email marketing automation software uses triggers to enable the automatic execution of specific workflows and tasks. Triggers are events like when someone subscribes to a particular service, adds items to a shopping cart, clicks a link attached to an email, or buys a product at a certain price. Moosend also permits users to set filters to specify the conditions that determine when automated actions are triggered. For example, some events should only be performed by specific contacts to trigger automated actions. Another filter is the time interval. This means users need to wait for a certain period of time after the execution of an event before the triggered action runs automatically. Let us find out how Moosend’s email marketing automation capability works by examining some of the challenges and issues that many marketers are facing. One of those challenges and issues is cart abandonment. Cart abandonment is a situation wherein a visitor started to add items to his or her online shopping cart; but along the way, left the website and didn’t complete any purchase. Moosend solves this issue through automation. With Moosend, users can automatically send an email to a visitor if that visitor is still not making any purchase within a certain period of time. Another marketing issue is customer churn. Customer churn happens when a customer decides to unsubscribe from a service or buy products from a different brand or company. Moosend is built to actually lower churn rates, allowing users to automatically send emails to customers to remind them of their subscription anniversaries and acknowledge their continuous engagement with the company. Moosend puts email marketing analytics to the next level by providing a simple yet powerful tool that permits marketers to monitor, measure, and analyze the performance of their email marketing campaigns. With this email marketing analytics tool, they can have real-time data at their fingertips so they can find out how people are engaging with their email campaigns and generate data-driven insights. Moosend’s email marketing analytics tool delivers awesome features. For instance, users can verify if the people who are opening the emails they are sending out are also clicking the links added to those emails. They can also determine which links are receiving the highest number of clicks. This way, they will be able to come up with valuable insights and increase click-through rates. The email marketing analytics tool provides statistics about subscribers such as the specific email clients and applications and devices they are using whenever they are engaging with email campaigns. Because of this, they can send email contents that are optimized for the email clients and devices their subscribers prefer. The tool also enables them to track campaign performance based on the locations of subscribers, which is very helpful for businesses that are operating globally. There are well-liked and widely used systems in each software group. But are they essentially the best fit for your company’s unique wants? A trendy software product may have thousands of users, but does it offer what you require? For this reason, do not blindly shell out for popular systems. Read at least a few Moosend reviews and consider the aspects that you wish to have in the software such as the cost, main features, available integrations etc. Then, shortlist a few systems that fit your requirements. Try out the free trials of these apps, read online opinions, get information from the maker, and do your homework thoroughly. This in-depth groundwork is certain to aid you find the best software platform for your organization’s unique needs. How Much Does Moosend Cost? We realize that when you make a decision to buy Marketing Automation Software it’s important not only to see how experts evaluate it in their reviews, but also to find out if the real people and companies that buy it are actually satisfied with the product. That’s why we’ve created our behavior-based Customer Satisfaction Algorithm™ that gathers customer reviews, comments and Moosend reviews across a wide range of social media sites. The data is then presented in an easy to digest form showing how many people had positive and negative experience with Moosend. With that information at hand you should be equipped to make an informed buying decision that you won’t regret. What are Moosend pricing details? What integrations are available for Moosend? If you need more information about Moosend or you simply have a question let us know what you need and we’ll forward your request directly to the vendor.